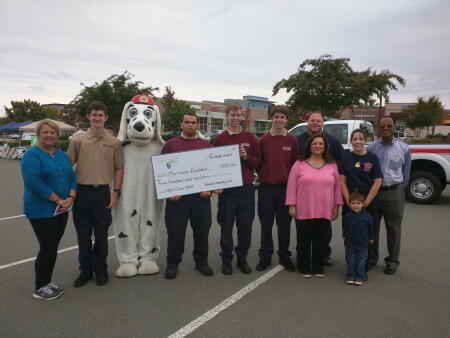 The Morrisville Fire Department’s Explorer Program received a $500 grant from the Morrisville Community Fund on Saturday, Oct. 10, during Fire Safety Day at Park West Village. Fund board members Jan Faulkner, Olivia Jacobs and Pete Martin were on hand to congratulate the program participants. Men and women between the ages of 15 and 18 who are interested in learning more about the fire service can participate in training activities offered by the Fire Department. Activities include, but are not limited to, safety, first aid and CPR, fire suppression, prevention and education, and equipment maintenance. Fire Chief Todd Wright mentioned that many Explorers go on to study Fire Science while in college.